Time for the 3rd of 5 Catapult starting flights. 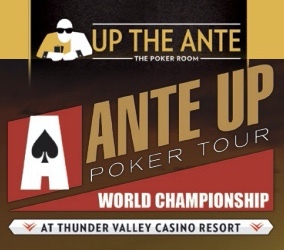 This is the kickoff event of the 2017 Ante Up Worlds, a $160 buy-in with $100,000 guaranteed. More than 500 entries are in from the first two flights, and the two flights tomorrow are anticipated to be the two largest-entry flights. Players begin with 12,000 betting units, play 20-minute levels during the 6 levels registration (and a single re-entry per player, per flight) is open. Play moves to 30-minute levels when registration closes at the start of Level 7. The top 10 percent of the field cash tonight, with play ending when down to 8 percent of the overall starting field.